All over the world, from New York City to Kiev to Tamarama, ‘street workouts’ on bars are revolutionising how people get fit, healthy and strong. Famously known as ‘jail gyms’, ‘ghetto workouts’ and ‘bar training’, this incredibly popular global movement, united by YouTueb and Faebook has captured the brains and brawns of millions. Gravity gets you ripped; anytime, for free! The significant benefits of bar training are unique, irresistible and irrefutable: it’s easy, it’s fun, it’s outdoors, it’s for everyone and it really works your body at the level of intensity you desire! Look at the strong and shredded torsos of the bar training fanatics around the world for evidence; nothing builds striated muscles and burns flab like bodyweight training. Bar training unites elements of gymnastics, compound body weight exercises, calisthenics, strength training, parkour, army boot camp, free-running and yoga. But there are NO RULES to your own creative versatility and that is the beauty of bar training. Individuals can experiment, explore and invent their own new moves or adapt and customize a program or routine that suits them best! It all began when pull-up and dip bars were installed in US jails for practical and safety reasons, eliminating moving parts and maintenance. The amazing transformations of the physiques of inmates were spectacular and inspired forward-thinking local government bodies around the world to erect simple ‘health and fitness courts’ in municipal parks. Such facilities proved to be hugely popular amongst the local communities. Young kids would swing and climb on the bars, sports teams would do supersets of pull ups and dips, passing joggers would bang out sit-ups and the elderly and infirm could begin doing gentle stretching exercises. 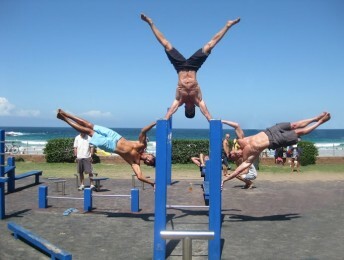 Most outdoor gym parks have a range of bars at a variety of levels. Usually people start with simple push-ups or assisted dips, which can be done on a bar at hip height to make it as easy as possible. Chest high bars allow for assisted body pull-ups with feet on the ground. Posts and poles of varying heights provide a platform for single or double-legged squats and lunges. Incline benches of varying degrees allow for the full range of sit-ups and crunches. Famous moves begin with the full spectrum of push-ups and pull-up variations; highly advanced techniques include muscle-ups, front-levers, back-levers, human flags, one arm pull-ups and a dizzying array of flips and jumps. To really ratchet things up, rolled up towels and old ropes are hung over bars to extract maximum burn from every available muscle fibre! The natural movements of bodyweight allow you to feel and understand your physiology at the most intricate levels. Every element and movement is from within your body, so you can clearly sense and comprehend it’s origin and purpose. In this manner you can prevent injury by ‘listening’ to your body and strategically working around any potential issues before they arise. The bonus of compound exercises is that they optimize complete muscle exertion in unison – so all your muscles/tendons/joints develop strength relative to each other; maximizing power and tone while minimizing the risk of injury. That’s why compound exercises are the best form of training for martial arts, wrestling climbing and all strength sports; football, ice hockey, rugby etc. 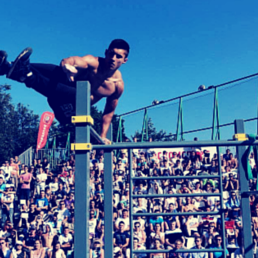 The growing international recognition of bodyweight training is phenomenal. Iconic rapper LL Cool J features intense bodyweight bar sets in his music videos and US ‘crews’ include The Bar-Barians as well as The 5D’s, The Barstarzz, The Bartendaz and many more. Regular comps and meets, organized online, are held all over the world. Elements include ‘freestyle’ bar routines as well as pure rep challenges for pull-ups, dips, squats and push-ups. At the highest levels of US bar crews, membership is open to everyone, but it can’t be bought. For example, to qualify as a Bar-Barian brother, you must complete the following set routine within six minutes, without stopping within each set: 5 muscle-ups, 45 dips, 25 pull-ups, 55 push-ups and finish with another 5 muscle-ups. Please try it, it’s a ‘zone of your own’ unlike any other! Bodyweight training is not just restricted to council authorized ‘bar parks’: any overhanging branch is ready for pull ups, any steel fence it a frame for dips and any stop sign is perfect for a human flag hold. Basically, it’s about having fun while getting strong, fit and healthy. Bar fanatics like Zakaveli, Hannibal, Giant and Marcus Bondi (yes that’s me) have been clocking up many millions of hits of their extreme bar training moves and techniques on You Tube and their respective websites. Bar crews from Brooklyn are now touring Ukraine and Germany and attracting huge crowds. Many guys who were once overweight or skinny have used local bar parks to shred up with quality muscle and then learnt to bust our awesome bodyweight moves like the muscle-up, which is an explosive pronated-grip pull up that launces your body high above the bar into dip position. Such moves are not only great party tricks; but full-on examples of body control and true functional human strength. Combined with strategic nutrition, bodyweight training can give you the strength, stamina, six-pack abs and muscle definition you have always wanted – all while having a fun lifestyle journey of soul-discipline and self improvement … awesome! Great post! I’m new to BW fitness but totally stoked about. What are your thoughts about ring based workouts versus bar based?